Is Serverless eating the stack? Or is it just hype? Serverless is a huge trend right now. It’s easy to see why, with some claiming to see as much as 90% cost reduction compared with running VMs or physically-owned hardware. In fact, the hype around Serverless seems to have reached a fever pitch, with some claiming that containers are deprecated and all future software will be built using Serverless. Is the hype justified, or just hype? In reality, Serverless is a subset of a more general-purpose computing trend towards auto-scaling, self-healing, and easily deployable microservices and simple provisioning of their dependencies (e.g., databases). Rather than Serverless eating the stack, the principles that make Serverless popular are eating the stack. In fact, we need to look no further than Kubernetes to see this in action. First though, let’s hazard a definition of the often ambiguous term. Gone are the days of buying too much capacity and having it sit around; your application will scale as the demand increases. You don’t have to worry about patching an OS, restarting a service, or handling a database upgrade. Code only runs in response to an event — no need for long-running containers or servers. Need a multi-AZ DB for your service? No need to file a ticket or talk to anyone. With a few clicks, you quickly have a datastore spun up, monitored, backed-up, and managed for you. Many of the same benefits provided by today’s Serverless platforms have now been brought to the world of long-running microservices via Kubernetes. Kubernetes can automatically increase or decrease the number of instances of your application running on the cluster. 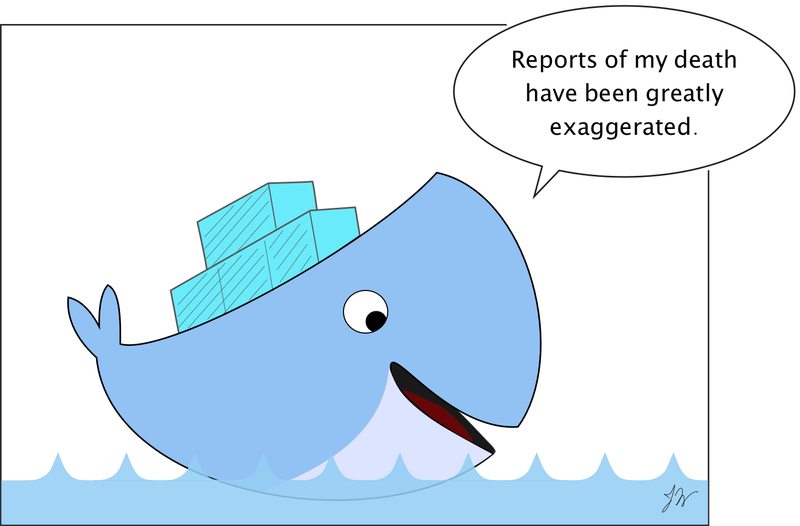 With Docker, a new instance can start in milliseconds. Kubernetes can also automatically scale the number of nodes in your cluster as the demand increases or decreases. Kubernetes constantly monitors your application and the cluster itself. If an instance of your application goes down, Kubernetes will restart it. If a node in the cluster goes down, Kubernetes will reschedule all the services from that node onto new nodes. Kubernetes has built-in facilities for requesting persistent backing storage that lives outside individual containers. With the integration of service brokers through the Service Catalog API, Kubernetes provides seamless integration with backing services (e.g., databases, queues, etc.). While Kubernetes brings the power of auto-scaling and self-healing to any containerized microservice, there are additional benefits and cost-savings that can be obtained by using a FaaS architecture. FaaS architectures are event-driven and they are much closer to true utility computing, given that you are only charged for running functions. Kubernetes actually supports this style of architecture as well, with a number of great projects already leveraging the power of Kubernetes to provide FaaS: OpenWhisk, Fission.io, Kubless, etc. In fact, this is such an important use case that Google has started a project that deeply integrates Serverless with Kubernetes, called KNative. It provides a common approach to running Serverless functions, generating events, and wiring these together. Running FaaS on Kubernetes actually makes a lot of sense, especially for the Enterprise. You get complete control over the underlying infrastructure and the underlying container image. You get complete control over the networking and connectivity. You also maintain more robust control over the runtime characteristics of your FaaS environment like cache warming. Given that FaaS is really just another form of microservices, there can also be a significant advantage to managing service-to-service communication of both FaaS-style services and long-running microservices with the same approach — enter the Service Mesh. As companies have begun decomposing large applications into smaller microservices (or even functions), a number of challenges have arisen. Both FaaS and long-running services have the same issues. Centralized policy enforcement, authentication, authorization, security, performance, and availability enhancements are needed by all services on the network. Many of the FaaS offerings for Kubernetes already support integration with Istio, a popular Service Mesh (e.g., Enabling Istio on Fission, Serverless service mesh with Kubeless and Istio). “As we see the gap of management and scaling between Serverless FaaS and hosted containers narrow, the choice between them may just come down to style and type of application. For example, it may be that FaaS is seen as a better choice for an event-driven style with few event types per application component, and containers are seen as a better choice for synchronous-request–driven components with many entry points.” (Serverless Architectures, emphasis added). Given the rapid adoption of Kubernetes over the last few years, coupled with the increased control and reduced vendor lock-in it provides, I would argue: In the future, Kubernetes will likely be the primary way enterprise companies deploy Serverless. The choice between long-running containers vs. short-lived functions will come down to picking the right tool for the right job. But both will live in the same environment (Kubernetes), auto-scaling and self-healing as needed. Both will communicate over a shared Service Mesh that provides unified policy enforcement, observability, and enhanced network reliability. And the deployment and management of services (regardless of the type or granularity) will be done through the same process. In Kubernetes, the industry has finally found a way to come together to solve some of the hardest (and most ubiquitous) problems of distributed computing—all while somehow avoiding vendor lock-in. Now, that is a trend that will surely eat the stack and change the technology landscape for decades to come. Thanks to Russell Stringham, Paul Jones, and Mike Rimer.